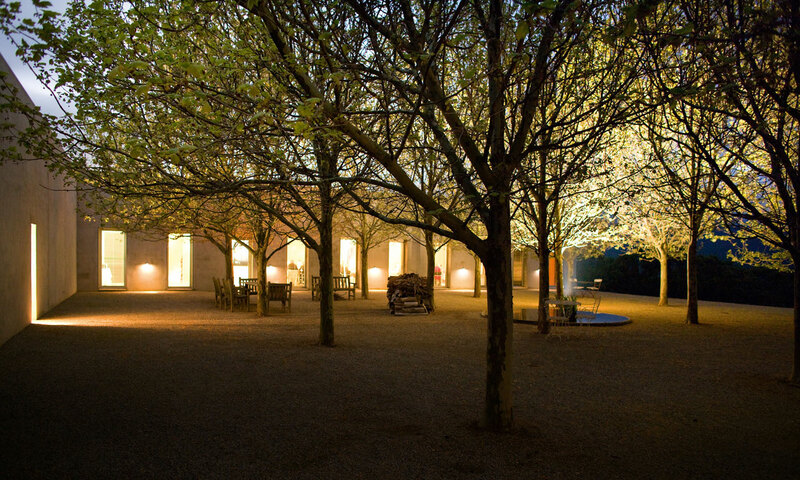 It’s classic food, awe inspiringly simple, which is to say entirely of a piece with the surrounds: the long, low Allan Powell house, built like an old fashioned Italian masseria – half fortress, half farm – the neat rows of vines (two blocks of chardonnay, two of pinot noir) that score the hill to the right. A log fire cracks and spits in the hearth, the great empty galleria beyond lined with the huge Bill Hensons created expressly for it. Ronnie likes Bill; likes the light and shade of his work, its classicism, edge. It reminds him of his countryman Caravaggio, he says. You suspect it also reminds him of himself. Sitting on the sofa opposite is the woman who reads that chiaroscuro like the weather, the other half of the Melbourne dining institution that is Café Di Stasio, Mallory Wall, variously described as Ronnie’s muse, wife, sister, daughter, though fellow restauranteur Neil Perry, for one, baulks at the latter: “I wouldn’t be treating my daughter like that: ‘come sit on my knee!’ It’s more husband and wife, slightly tortured and twisted.” The subject under discussion around the fire on a chilly day at the tail end of winter is restaurants, why Di Stasio has, for a quarter of a century, resisted the temptation to which pretty well everyone – especially Perry but even the man Di Stasio calls his “brother” Tetsuya Wakuda – has succumbed: to go forth and multiply. How did a man renowned for his mercurial expansiveness turn out to be the tortoise in a culinary landscape packed with hares? Implicit in that is another question often posed when Di Stasio comes up in conversation: how did all this come from just one 60seat restaurant sandwiched between St Kilda’s 7/11s and a café advertising $12 jugs of beer? ‘All this’ encompasses much more than just the restaurant, the house down the road packed with more Hensons (his collection is said to be the best in the country, and second only to Elton John’s overall), the estate next to Coldstream vineyards in the Yarra Valley – maitre d’ and chef stationed in the industrial kitchen – and the white Land Rovers that alternate with Di Stasio’s beloved grey blue Austin Healey. It also includes his Italo-Australian passion projects: the push to replace the Philip Cox designed Venice Biennale Australian Pavilion, currently under the stewardship of Simon Mordant, but sparked by the 2008 ideas competition on which Di Stasio outlaid an estimated $200,000; or the “Renaissance” dinner he held at the Yarra Valley property as part of his patronage of the National Gallery of Australia’s major exhibition on the period earlier this year. Then there are the accolades Café Di Stasio continues to garner, including Hottest Classic in John Lethlean’s 50 hottest restaurants, published in July, a list otherwise dominated by young up and comers. That cautiousness stems from Di Stasio’s habitual anxiety, an instinct he says that has always kept him focused, out of trouble, close to home, earning while the earning was good, which is to say before the last five years. “Once upon a time there was a lot of money in the restaurant business, right up until 2008 and the GFC, and then it stopped,” he says. “Today, there’s too much competition, the margins are worse, the cost of produce and staff have gone up and it’s hard to get good staff. Why would you want to run more than one? And if you’re not enjoying it, it shows. You can’t fake it. All of which makes the reason for our lunch – the reason for which Di Stasio has allowed a rare public glimpse of his house – that much more interesting. Because, after 25 years, RonnieDi Stasio is breaking his golden rule. In November, he will open the new 35seat Bar Di Stasio on the right flank of his beloved St Kilda premises after a seven month, $1millionplus renovation, into the toughest restaurant climate in years. As that money suggests, it’s a big deal. The new space is the work of young Melbourne architect Robert Simeoni, Ronnie’s new Allan Powell (who also did the Café Di Stasio interior). When the AFR Magazine visits, a lifesize photo by Melbourne artist Callum Morton of the demolished interior fills the front of the former Japanese takeaway, backlit at night like a light box. That installation will be replaced in the finished restaurant by another work by Morton –Ronnie’s new Bill Henson –who will also ‘frame’ the pattern left on the wall by the underpainting and tiles that have been removed. There’s an 8metre marble bar, a 20seat private dining room featuring the work of his favourite furry Kathy Temin, dry cleaned after its stint beside the Yarra Valley fire. the pillow beside him most nights. Instead he opts for St Kilda. 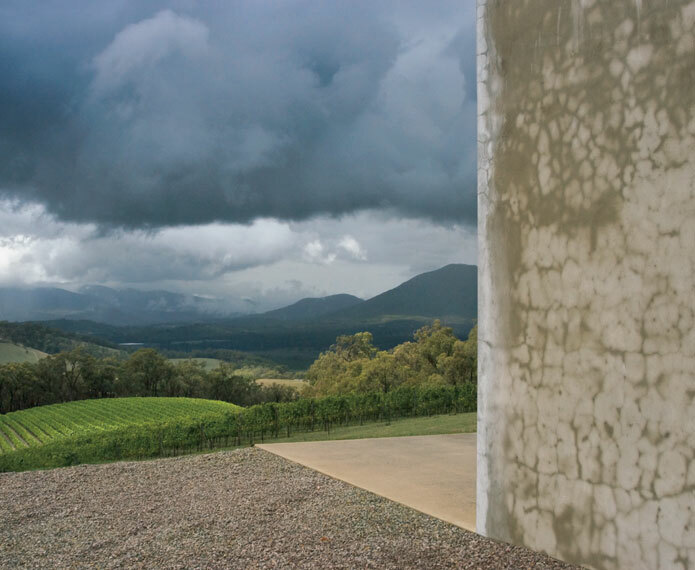 Back when he started out there, artists like Henson, Juan Davila, Jenny Watson, Peter Booth – whose works people the walls of the Yarra Valley house – all passed through his doors. But, over the years, St Kilda has gentrified, food with it, until it is almost a national religion; Di Stasio’s one of its fine dining chapels – almost despite Ronnie’s best efforts. He first called it a café, after all, to dial back the expectations, lull customers, then over-deliver. He’s certainly waged what Sydney Morning Herald restaurant critic Terry Durack has described as a “one man crusade against dull, polite, one-dimensional dining” ever since. He has staged a rejuvenation every seven years – from the Yarra Valley property and Venice to the Renaissance dinner, though never quite on this scale,which involves a new kitchen, garden, premises. “It’s a rebirth, a renewal, a renascimento,” he says with his usual ebullience. “Next door is going to be the hub for artists getting together, architects, creative people. It’ll be a $1.50 espresso standing up, amartini for 18 bucks, or the most exquisite little bowl of al dente pasta, roast duck at the bar or a spiced pigeon cherry pie. The collegimento or ‘collective’ is the term Di Stasio uses to refer to the design team he has formed around Bar Di Stasio, which also includes his long-time graphic artist David Pidgeon, and Jason Smith. It’s what he has always done, from the Yarra Valley house that he and Powell worked on intensely seven years ago, or the Henson installation that came after a similar collaboration, to the Venice Pavilion competition, where he worked with Pidgeon, Morton and Smith (the results showed at Heide). Di Stasio is, though, he admits, happier than he has ever been as the new expandedDi Stasio empire moves into its 25th year in 2013, with new growth on its right flank. Is this a new ‘Zen’ Ronnie? “I would say more Rinaldo now,” he suggests.